Does a Nurgle Daemon Prince have to be bloated? I picked up the new plastic Daemon Prince kit because I want to make a Nurgle DP with wings to lead my new Death Guard CSM army. While looking the sprues over, I realized just how thin this DP is. It would take a whole lot of green stuff to bloat this guy up into a proper follower of Nurgle. So I got to thinking, does it really need to be bloated? 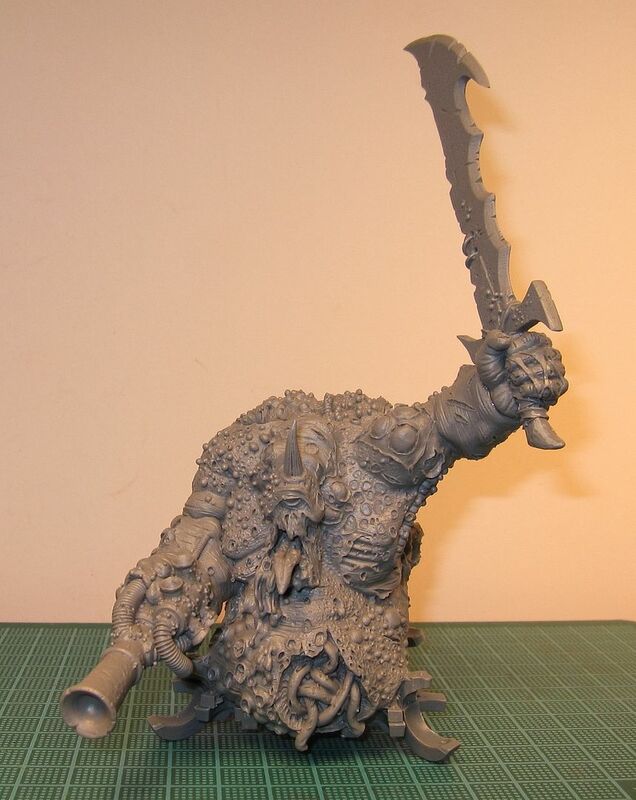 What makes a DP look like a follower of Nurgle? I put together this list of common traits that followers of Nurgle get. I searched the web and bloating is almost always listed as the first trait of Nurgle followers, but as you can see, there are still quite a few other traits that I could use to 'Nurgle-fy' the Daemon Prince without bloating, but would it look right? I am not entirely convinced, but what do you think? I have completed my September project for the 40kFC Painting Challenge, a Killa Kan Attack Mob. I was able to paint Kans because they count as a Fast Attack choice in the IA8 Dread Mob list. I tried not watering down the Devlan Mud wash on these kans to see what effect it would have. I think it looks ok.
Next month I am planning on painting my Ork Mega Dread as my Heavy Support choice. Then for November, my Ork Meka Dread. Finally, for December, I just have to put together and paint three Ork-themed objectives. Empire & Orks down, Ogres & Death Guard up! Although I have only gotten in two games with this Empire army I was gifted, I have decided to put it away. While they seem to have some real potential in 8th edition, I just have too many other projects and armies that I want to concentrate on and I really do not have any desire to spend time on this army. I am not sure if I want to get rid of it either, so I am going to pack them up until I feel like doing something with them. 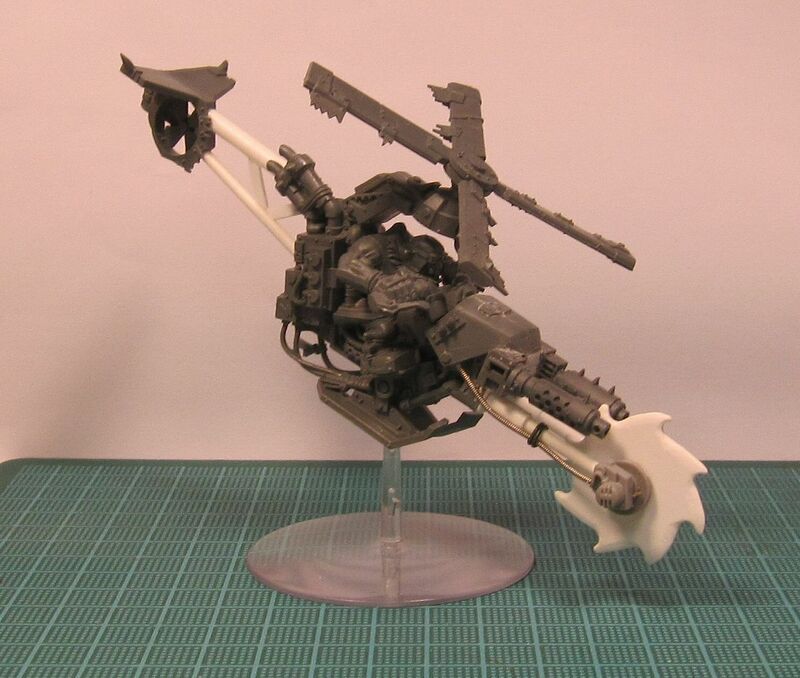 I am so burned out on Orks right now because of my resolutions. I knew when I made my resolutions this year that this would most likely happen since they all focused on Orks. I did it anyway because I wanted to get as many of my Orks painted as I could. So, with the exception of the 40kFightClub Painting Challenge, all of my resolutions are out. It was worth the attempt because of what I got done. Now that I do not have to concentrate on my Orks, I am free to get back to work on my Ogres. However, I am still looking for a tribe name and tribal markings so that I can finish up my first unit of Bulls. Right now I am tossing around the name The Gutlords. It may not be the most original name as it is the same name as an Irongut champion, but it has a certain ring to it and I like it. I think it suits them as well. If I do go with this name, I would still need to come up with some kind of tribal marking. Anyone got any ideas? I have decide to begin work on a a Death Guard army. I got some good advice from DG players over at the 40kFightClub on putting a list together. With the stuff I already have, I just need a couple more things to have a playable army. I plan to take my time with this army, doing lots of conversion work in the process to really make the army unique looking, so it will probably be a while before it is ready for playing. Nurgle Daemon Princes with wings seem to top the list as the best HQ choice for a DG army, so this will be one of my first projects. My current Nurgle DP does not have wings and I do not want to add wings to him as I run him in my Chaos Daemon army where wings are just too expensive to use. Besides, this gives me a reason to pick up the new plastic DP kit, but it will need a lot of green stuff to make this look right. I need to make a couple Plague Marine Champions with Power Fists, and assemble the rest of my Plague Marines. 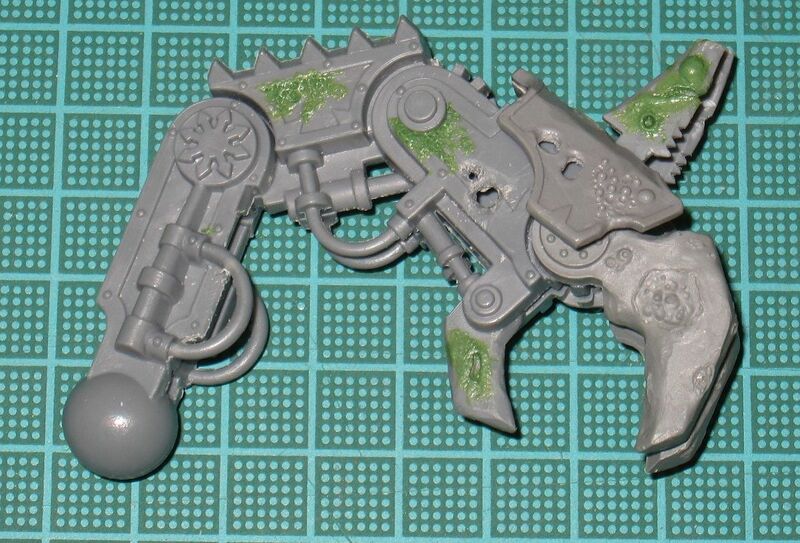 I will need to pick up two or three Rhinos and a unit of Obliterators as both were highly recommended. My Plaguebearers can proxy for lesser daemons until I such time as I can build some plague zombies for a 'counts as' unit of lesser daemons. 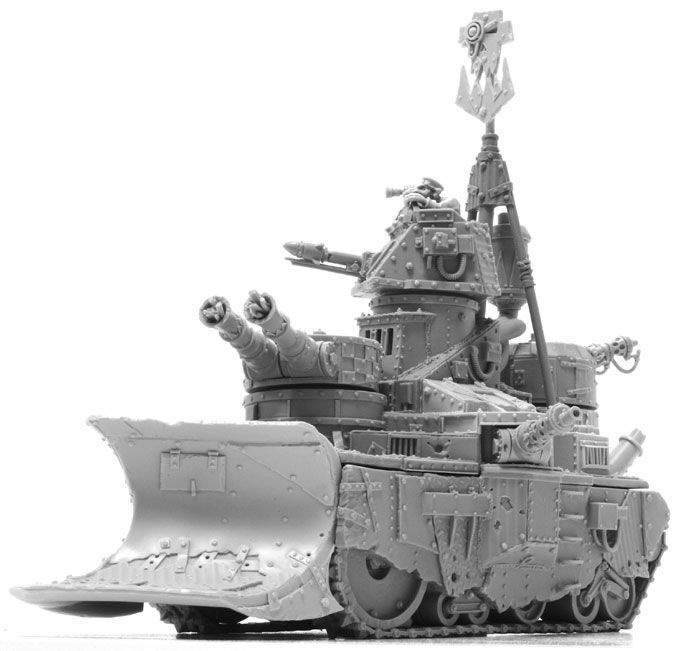 Not really required, but would be a cool conversion. I could also use them in a Servants of Decay army from Imperial Armour 7 if I ever wanted to go that direction. First though, I need to finish up my Plague Hulk. 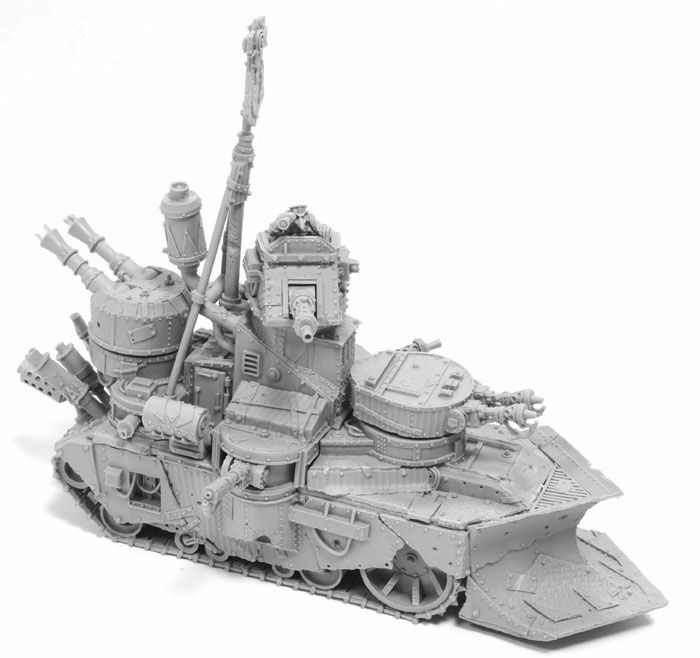 New stuff coming from Forge World. Both of these models are sweet. It is good to seen Necrons getting from lovin! 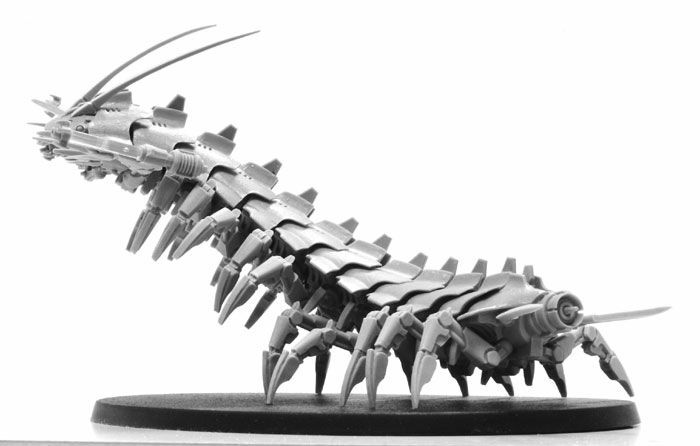 I must say that I really like the mechanical insect look of the Tomb Stalker. Is this a preview of what the Necron future holds? I hope so. This seems like it would be a good start to a Death Guard list but I am not sure where to go from here. What else would I need to build a decent list? If anyone would like to offer up some advice, it would be appreciated. I finally got around to putting the final touches on my Nurgle Blight Drone this weekend, which was just some final touch ups, finish spray, and adding static grass to the base. I can finally cross it off the project list. 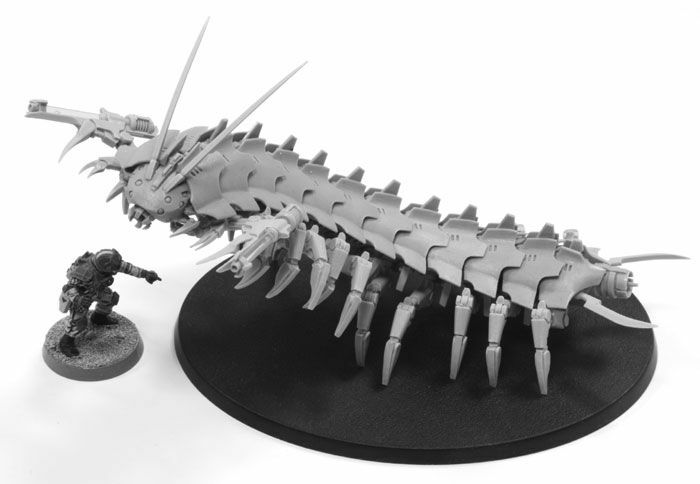 As much as I like the Forge World Plague Hulk kit, one thing really bothers me about it, the legs. While its main body looks great, the legs are from the standard Soulgrinder/Defiler kit. The kit comes with Nurgle Infested shield plates and claws to add to them, but the legs still stick out as too new looking compared to the rest of the model. 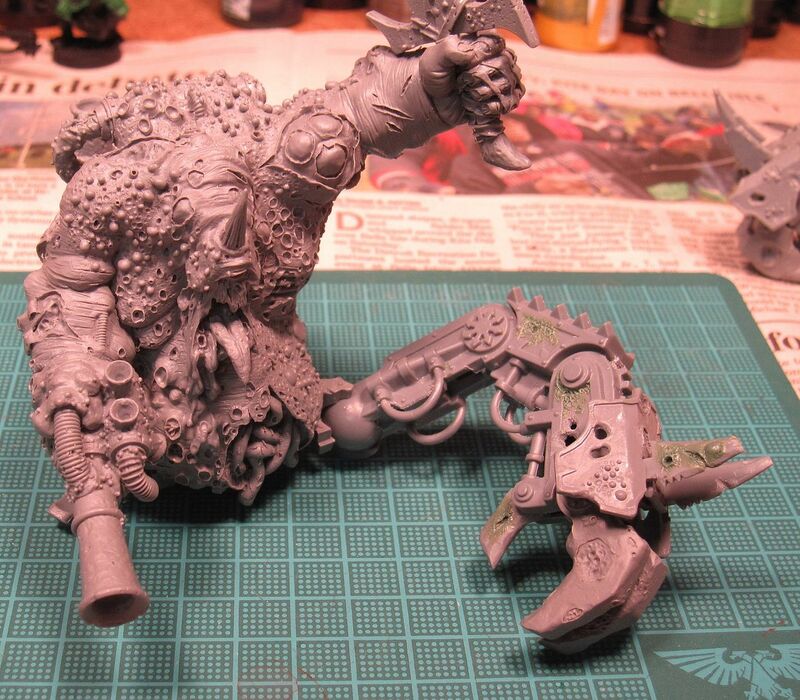 So I have decided to 'Nurgle-up' the legs on my Plague Hulk. Here is a picture of the first front leg and claw that I have been working on. I think these little extra touches are just enough to tie the whole model together and not make the leg stick out anymore. I still have a little bit more work I want to do on this leg before I will be done with it. Here are some close up pictures of the leg. Today is the one year anniversary my first post. 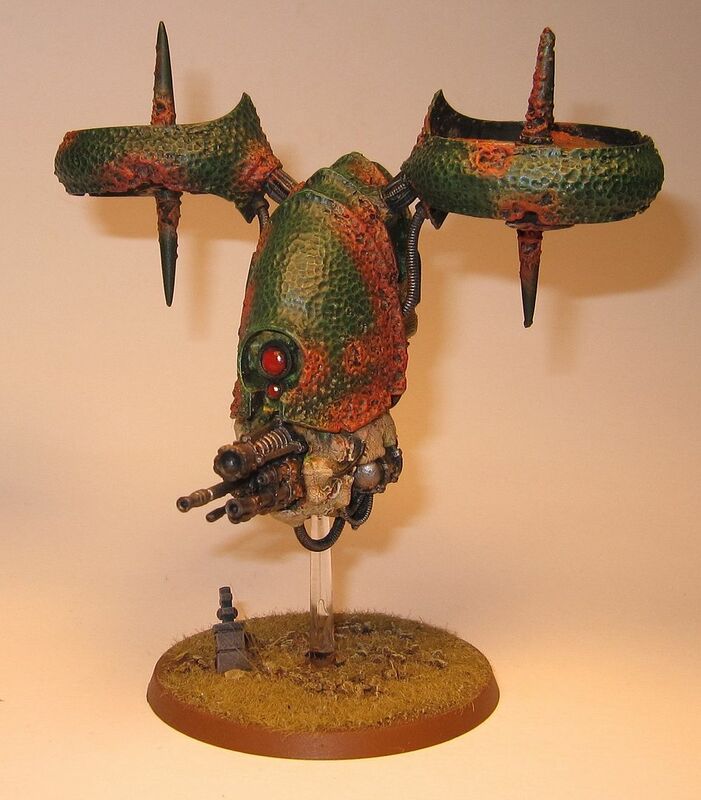 I originally started this blog for my Nurgle Chaos Daemon army. I was doing a Tale of Four Games at the time and I was planning on documenting my progress it in. Unfortunately, we never did finish the ToFG, but I did get about 1500 points of daemons painted. 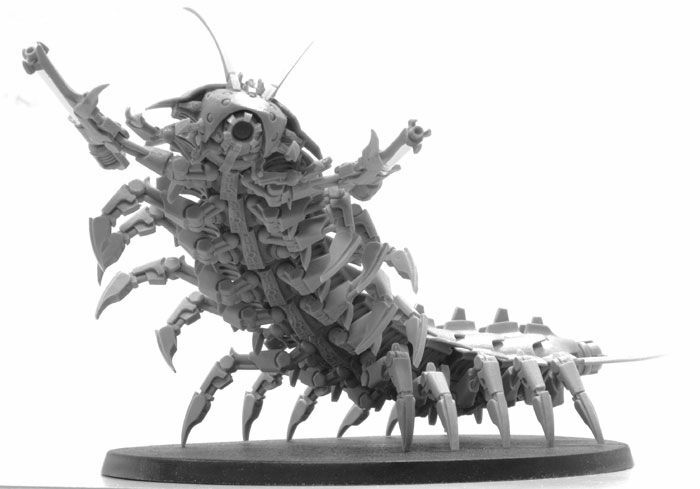 In honor of this anniversary, I have started work on a special model for my Nurgle Daemon army. Here is a preview picture. Last night, I was up at my FLGS for Tuesday night gaming and I played my second game with this Empire army I am trying out. This time, I played against Gargunki's Lizardmen army. We played the Watchtower mission from the book with Gargunki controlling the tower. This time, I decide to use an Arch Lector as my general instead of a General of the Empire. I typically ended up storing two dice in the Rod of Power each phase. Those combined with the extra two dispel dice the Arch Lector generates and the one the Warrior Priest generates, I generally had more dispel dice than my opponent had power dice. It allowed me to shut down practically all of the Slann's magic phases. The Slann got off two spells the whole game (although it only went four turns). It was pretty impressive. The most exciting phase of the game was when the Slann rolled snake-eyes for his power dice, and cast Regrowth on one of his Saurus units with IF. He had the magic item that allowed him to move the miscast roll to an enemy wizard on a 2+, but he rolled a one and ended up only loosing one magic level. My magic phases were pretty uneventful as I did roll higher than five power dice all game long. The Rod of Power help with this, but I played conservatively and made sure to store two power dice to use as dispel dice in the opponent's magic phase. The war machines did not do much in this game. Two units of scouting Chameleon Skinks killed off three of the four with no problems. It seems that scouting skirmishers who hunt war machines run rampant in my local scene and since I have been grouping three of the war machines together so they can all benefit from the Master Engineer, they have a tendency to not survive long. Not sure what to do about this yet. Empire is an interesting army to run. Not sure if I am sold on them at this time. Overall this was a fun game, however, it was one of those nights when the dice were just rolling terrible for me during several parts of the game. In one enemy shooting phase, I failed five out of six 'Look out Sir!' rolls. The Greatswords (led by the Warrior Priest) were in combat with a unit of Saurus warriors and failed to do a single wound. They broke but at least they were not run down. Still going to get in two or three more games before I decide. This was a list to test out some of the things for this army. Normally I would not arm my General of the Empire with a Runefang; it seems too expensive for what it does. It also uses up all of your magic item point allowance so you cannot give him any kind of ward save which I would think he really needs. I also tried out a Marksman with a Hochland Long Rifle and I am not sure if this was worth it or not. I will have to try this some more. The Master Engineer with a Repeating Handgun worked out good. I kept him centered in between the Great Cannon, Helbaster, and one of the mortars so he could help out with any misfires. He also helped to kill off the Gutterrunners who were harassing the war machines using his Repeating Handgun. I liked the warrior priest even though I never used any of his prayers. The extra dispel dice he generates is really handy. He also is a nice character to add to any unit to add a little extra punch. I really like the Rod of Power, it is a very handy magic item and at thirty points it seems a bargain. I cannot see not taking it for a Wizard Lord. I am not sure what to think of Detachments at this time. The concept seems sound, but it makes deploying a little trickier. I was able to successfully countercharge using the Free Company and it won combat for me. It seems mandatory to do if you are playing an infantry heavy list like I was. I did not get to try out the effectiveness of the Halbardiers as I lost 37 of them in one round of shooting from the Skaven. Two very well aimed shots from both the Warp Lightning Cannon and a warlock with Doom Rocket just decimated them. The Swordsmen worked out good. With their higher WS and I, and with the help of the Warrior Priest and the Flaming Sword of Rhuin spell, they were able to not only withstand a charge from a large unit of Rat Ogres, but to beat them in combat and run them down. Overall I enjoyed playing this army. They play quite a bit differenly than my Ogre Kingdoms army. I am looking forward to getting in a couple more games with them but I will need to tweak this list a bit first. About two weeks ago, an old friend of mine gave me his old 5th/6th Edition Empire army because he has no interest in playing anymore. I finally got a chance this last weekend to go through it and boy is there a lot of stuff. Here is the list combined with the little bit of Empire stuff I had left over from 6th Edition. To be honest, I have no idea what to do with this army. 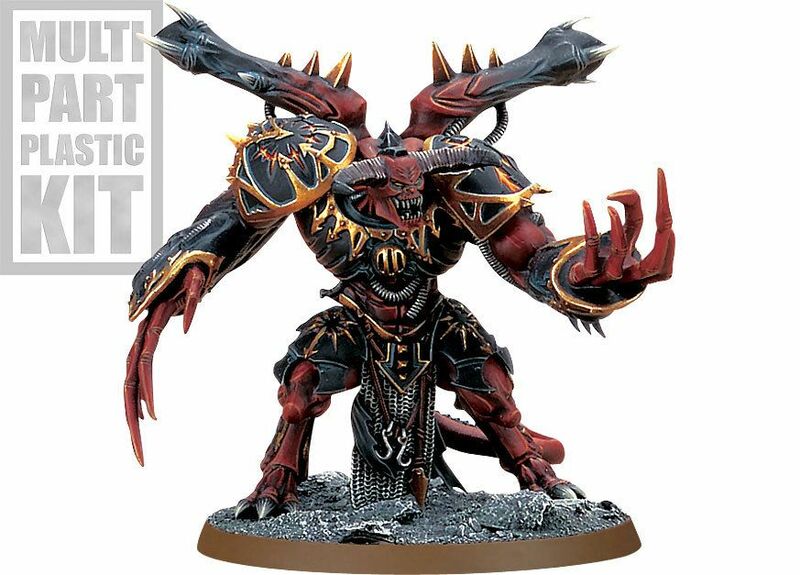 I already have too much Warhammer stuff as it is, but it would be a shame to waste the opportunity to try out this army. I do not think Empire would not have been an army I would have considered if I was to do yet another army. The only problem with this army is that it is almost all unpainted and I have no interest in painting it. There is also a lot of stuff that needs repairing before it can be used. I got a copy of the Empire army book and have read through it. It seems that I could put together a pretty decent list with this stuff. I also picked up a box of the new Plastic Empire Wizards on Monday just to check it out. I am planning on getting a game in this weekend with them to see what they can do. After a very busy month of August, I managed to finished my Painting Challenge Project for the month, a unit of Burna Boyz. I had orginally hoped to paint a unit of twelve boyz, but there was just not enough time to paint more than five. 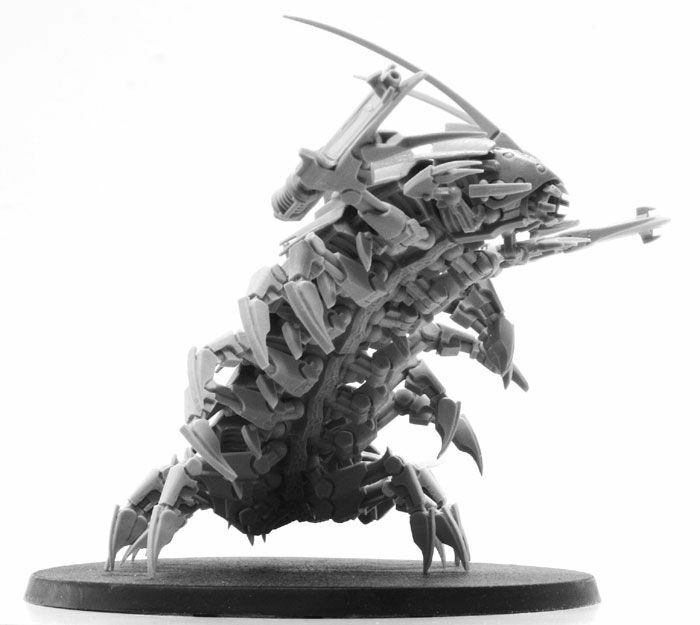 For September's project, I am going to paint a Killa Kan Attack Mob of three Kans with Rokkit Launchas. I think I am going to set aside painting my Ogres for this month (since I still have not come up with a tribe name yet) and try to catch up on some of my Ork painting. For the past two months I have squeaked by on painting only minimum sized units and I was really wanting to finish whole units. I have already started painting another set of five Burna Boyz, my last Deffkopta, and my Fighta-bomma since it has been too hot and humid for the past couple days to prime my Killa Kans. 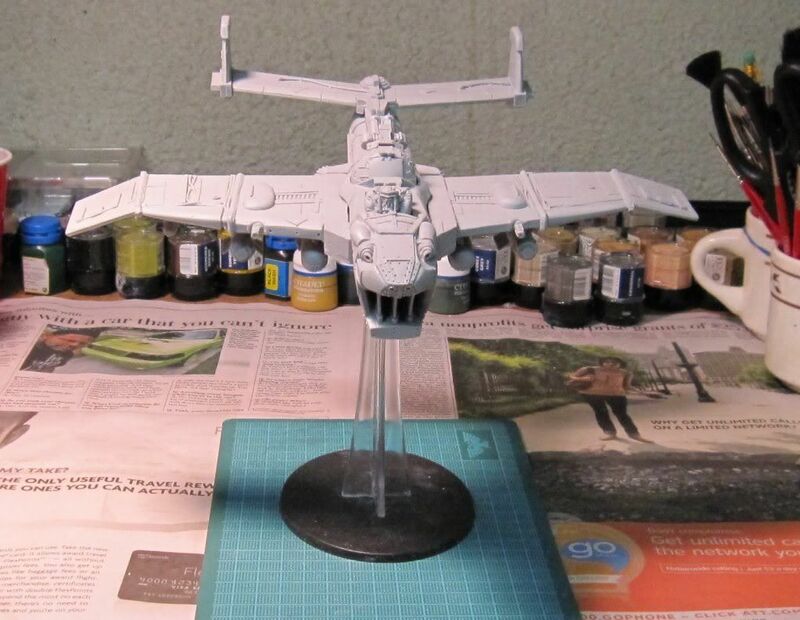 Once they are primed, I will paint them first and then finish these other projects. With the end of August, the year is now two thirds over. Looking at my resolutions for the year, I am not as far along as I had hoped to be at this time with only having two completed resolutions. I was expecting to have finished three or four. If it was not for the release of 8th edition Fantasy and me starting up an Ogre Kingdoms army, I think I would be. However, I still think I can finish them all. The only one that I question is the Skullhamma as I have not even started it yet.